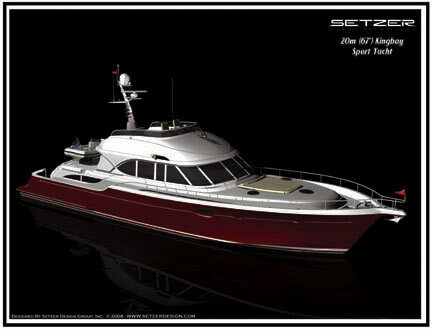 Ward Setzer, principal of Setzer Design Group in Cary, North Carolina, has unveiled the model of the retro-modern, 67’ design for Kingbay Yacht Manufacturing Co. Ltd. of Ningbo, China. This unique design is intended to be a blend of features from the designer’s larger projects yet within the easily maneuverable platform of a smaller cruising vessel. The three staterooms include a full beam master suite aft and optional fourth stateroom forward. The vessel’s hull form is designed to allow for a variety of powering packages, including its standard CAT C12E engines that will provide a cruising speed of 18.5 knots and a top speed of 25 knots. Further powering options within the design’s stand-up engine space will provide speeds up to 32 knots. The design also includes a generous galley, open salon and dining amidships, as well as a piloting area starboard with generous chart flats. The cockpit offers an oversized swim platform, built-in seating, tackle and general storage cabinets, and a sink/grilling zone. The aft coach house includes two exterior seating options along with the standard tender storage layout. An elevated fly-bridge steering station and adjacent lounge area give guests an uninterrupted view of the sea. The overall design has been kept low, sleek and easily operable by its owners, and thus not requiring a professional crew. 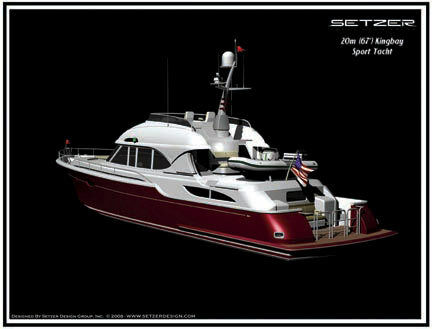 The result is a fast-passage-making cruiser with all the modern amenities of Setzer Design Group’s larger yachts. Further versions are planned to create a line of vessels in the form of sedan/cockpit and sun-roof express models. Since the U.S. markets are the primary audience for this design, most of the marine products used to manufacture the vessels will be imported from the United States to allow for service and warranty from U.S. based vendors. Sales of the vessels will be coordinated through a well-known dealership in South Florida.